UAE – Up to 570 people were rescued after spending overnight in rain-soaked mountains that triggered flash floods in Ras Al Khaimah on Sunday, according to RAK police. It was second day of unstable weather that brought a rush of surface runoff from the emirate’s majestic peaks, causing fast-flowing torrents in wadis, and inundating houses and vehicles in some low-lying areas. 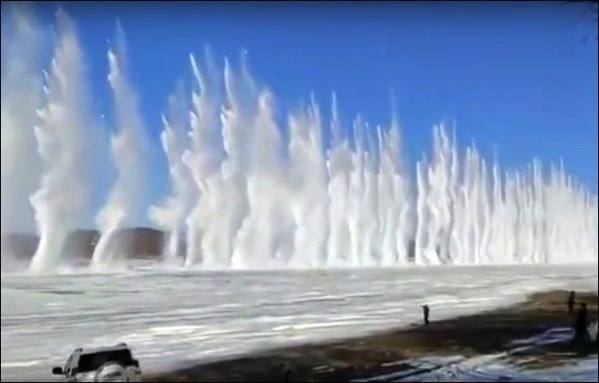 Siberia, Russia – Synchronised explosions are used to unblock the Amur River, a major waterway in the Russian Far East to protect villagers from flooding. Such explosions are common at this time of year – but not always as aesthetic. Carried out by the Russian Emergencies Ministry, the aim is to prevent walls of ice behind which the river level rises, posing a threat to remote settlements. In the Western Pacific: Tropical Depression 31w (Kirogi), located approximately 142 nm east-northeast of Ho Chi Minh City, Vietnam, is tracking west-northwestward at 15 knots. Greece – The death toll from flooding in and around Athens rose to 19 on Saturday after three more bodies were recovered west of the Greek capital. UAE – Five Indian nationals were rescued from a car that was washed away by wadi flood waters in Khor Fakkan on Friday after heavy rains and rescue personnel are searching for another missing student. Australia – Heavy rain caused flash flooding in parts of Melbourne on Saturday (Nov 18), after the Australian city was lashed by a series of storms. Water poured down the steps to Flinders Street railway station in the heart of Melbourne, and commuters were seen removing their shoes to walk through ankle-deep water. Rain also seeped through the roof of Melbourne Airport’s international terminal, after 20mm of rainfall in under 10 minutes. Indonesia – A landslide struck a hotel in the Cianjur district in West Java, Indonesia claiming the lives of three people and injuring several others. Earlier, landslide in Sukaremi sub-district of Cianjur killed two people, bringing the death toll to five. UAE – Heavy rainfall lashed most areas of the UAE on Wednesday causing severe flooding in Dubai and Abu Dhabi. The Dubai Police has recorded at least 253 traffic accidents and received 3,200 calls in a span of seven hours from 6 am to 1 pm. Floods in Hatta swept away a car, claiming life of a 7-year-old boy. His other two brothers managed to escape. Flights at Abu Dhabi airport were suspended for several hours on Wednesday. A hailstorm also lashed Abu Dhabi. Schools have been closed since Wednesday. Heavy rain associated with thunder and strong winds swept across Jebel Ali, Fujairah, Sharjah and Al Ain. The National Centre for Meteorology and Seismology recorded 294 millimetres of rainfall on Wednesday near Al-Ain. USA – Heavy rains slammed parts of the Southeast for a second straight day Thursday, part of a series of storms that has killed four people, flooded homes and wrecked highways. Flash-flood watches were in effect from eastern Texas through Louisiana and up into the Mississippi River Valley — including Arkansas, Tennessee, Missouri and southern Illinois. Some bayous and creeks near Shreveport are expected to crest at levels not seen since 1991. In Mississippi, officials warned of flash flooding. Gov. Phil Bryant declared a state of emergency. Angola – Flash floods in the Tchioco neighbourhood, in Lubango, southern Huila province in Angola have claimed the lives of at least 24 people when the Capitão river bridge collapsed as a result of the rains. More than 30 people are believed to be still missing. DR Congo – More than 550,000 people have been affected by floods since October last year in the Democratic Republic of Congo (DR Congo), the UN Office for Humanitarian Affairs (OCHA) said Wednesday. The revelations were made during the UN’s weekly press conference in the Congolese capital, Kinshasa. OCHA said at least eleven of the country’s 26 provinces were affected, and Tshopo province was the most affected with close to 400,000 people displaced. “Last weekend in Tanganyika province, torrential rains caused landslides which destroyed roads. Humanitarian activities were suspended, yet over 64,000 people are in need of humanitarian needs,” OCHA Spokesman in DR Congo Sylvestre Mudingayi said. According to OCHA, the floods have equally destroyed close to 65,000 houses and some 5,000 hectares of farm-land. “The Congolese authorities, with support from the humanitarian community, have already responded to some needs, especially by providing financial assistance and medical as well as food aid,” Sylvestre said. The spokesman said many of the humanitarian needs for the victims such as foodstuff, household items, blankets and water have not been satisfactorily addressed. Philippines – Continuous heavy rains have caused severe flooding in some parts of Camarines Norte province, leaving some motorists stranded and some classes suspended. In Daet town, floodwaters have already reached some residential areas and caused the stranding motorists on flooded roads. UAE – Flash floods following good rains in the United Arab Emirates have raged through Fujairah forcing police to evacuate residents from waterlogged homes in the Eastern Region of the country. Tropical cyclone 11p (Winston), located approximately 121 nm northwest of Niue, is tracking eastward at 04 knots. Tropical cyclone 13s (Uriah), located approximately 838 nm southeast of Diego Garcia, is tracking westward at 11 knots. Oman, UAE – Stormy weather lashed parts of UAE and Oman on Tuesday with Khorfakkan and Dibba having the highest rainfall. Heavy downpours have been recorded in parts of Khorfakkan, Sharjah, along with Fujairah and Ras Al Khaimah. A marine alert has been issued for fresh and strong winds over the Oman Sea. Heavy rainfall has been occurring in parts of Muscat. Tropical storm 04w (Maysak), located approximately 142 nm north-northeast of Manila, Philippines, is tracking west-northwestward at 10 knots. The super typhoon dissolved into a tropical depression and made landfall in the Philippines Sunday, forecasters said, easing fears after thousands of residents fled remote coastal villages to avoid potential giant waves. Tropical storm 05w (Haishen), located approximately 103 nm northwest of Chuuk, is tracking west-southwestward at 03 knots. California, USA – Tornado in Pomona has damaged at least 17 houses including two shops and a church. The path of the tornado was about 7 to 10 miles long and a quarter to a half mile wide. Heavy damage is being reported on the UU Highway northeast of Pomona. Emergency crews visited house to house pounding on doors to find people in their damaged homes. Nepal – Another heavy storm hit Kathmandu on Saturday evening, halting traffic at various places in the capital with strong winds and disrupting the lives of thousands of people. Kenya – Five people are dead and scores others missing following floods in Bondo, Siaya County after heavy rains in the Western region. The number of those dead is likely to go up as other people are still missing. Missouri, Kentucky, USA – The devastation in Kentucky came as a dangerous storm swept through, causing flash floods. As many as 12 tornadoes were reported in parts of Colorado, Kansas, Missouri and Oklahoma, but there were no immediate reports of major damage. Kentucky was soaked by up to 5 inches of rain, leading to flash flood warnings in Louisville, where cars were inundated as roads turned into rivers and officials conducted more than 100 water rescues. UAE – A major sandstorm hit the United Arab Emirates, blotting out Dubai’s famous skyline. High winds have whipped up desert sands, severely reducing visibility and causing residents to suffer breathing difficulties. The storm has led to flight diversions from Dubai’s International Airport, leaving many passengers stranded. Abu Dhabi police say the storm has caused a serious traffic accident and forecasters predicted it could last for days. Tropical cyclone (tc) 14s (Glenda), located approximately 723 nm southeast of Port Louis, Mauritius, and is tracking south-southwestward at 14 knots. UAE – A sandstorm in the Fujairah region of the United Arab Emirates (UAE) today claimed the lives of two people. Madagascar – More flooding in Madagascar’s capital Antananarivo and the surrounding areas has claimed the lives of at least 14 people and displaced more than 21,000. As of 18:00 on 23 April, the Ministry of Health (MOH) of Guinea has reported a cumulative total of 218 clinical cases of Ebola Virus Disease (EVD), including 141 deaths. To date, 191 patients have been tested for ebolavirus infection and 115 cases have been laboratory confirmed, including 72 deaths. In addition, 42 cases (34 deaths) meet the probable case definition for EVD and 61 cases (35 deaths) are classified as suspected cases. Twenty-six (26) health care workers (HCW) have been affected (18 confirmed), with 16 deaths (12 confirmed). On 26 April 2014, the Ministry of Health of the United Arab Emirates (UAE) reported seven additional laboratory-confirmed cases of infection with Middle East Respiratory Syndrome coronavirus (MERS-CoV). TThe total number of suspected cases in the ongoing Ebola haemorrhagic fever outbreak in Guinea remains 86. Two more cases died bringing total deaths to 62 (CFR: 72%). The cases are spread across three districts in south-east Guinea (Guekedou, Macenta, and Kissidougou districts). Seven of the cases are currently undergoing treatment in isolation units in Guekedou district. Investigations on reported cases in Liberia and Sierra Leone along the border with Guinea are ongoing. On 23 March 2014, the National IHR Focal Point of the United Arab Emirates (UAE) notified WHO of an additional laboratory-confirmed case of infection with Middle East respiratory syndrome coronavirus (MERS-CoV). The World Organization for Animal Health says deadly foot-and-mouth disease has spread to another farm in the North Korean capital Pyongyang. On 5 February 2014, the National Health and Family Planning Commission (NHFPC) of China notified WHO of ten additional laboratory-confirmed cases of human infection with avian influenza A(H7N9) virus. On 3 February 2014, United Arab Emirates (UAE) notified WHO of an additional laboratory-confirmed case of Middle East Respiratory Syndrome coronavirus (MERS-CoV) infection. A major sandstorm is expected to hit the UAE this weekend. The storm is expected to create a visibility of less than 500 meters. The sandstorm was expected to erupt in Iraq and travel through Kuwait to hit the UAE on Friday, gripping the country for two days. Wind speeds of 25-35 knots are expected. In Saudi Arabia, too, a government met centre warned that the kingdom would be hit by extreme climatic conditions over the coming three days. On an average, the UAE faces between 8 and 10 severe sandstorms each year. In many cases these sandstorms can last for several hours or sometimes even the whole day, bring traffic to a standstill, forcing places of work and school to close and significantly increasing the number of hospitalizations. Tropical Cyclone Twenty-one was located approximately 200 nm south-southwest of Diego Garcia in the South Indian Ocean.